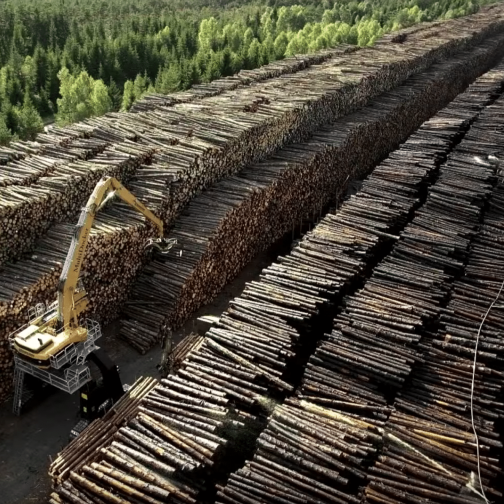 Ecological issues are challenging the companies of tomorrow. Offering comfort, estheticism and durability, wood seems to be the best alternative for French construction industry. 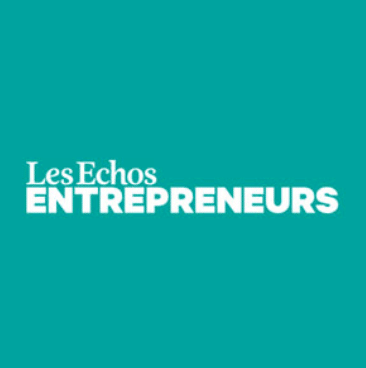 According to Le Moniteur, Woodoo is one of the most disrupting start-ups in this sector. At JEC World 2019 – the leading international Composites Show – Woodoo was amongst the 10 finalists, selected from 120 entries this year. During the event, we had the chance to participate to the pitch sessions in front of an international jury that awarded us JEC World StartUp Booster Winner! 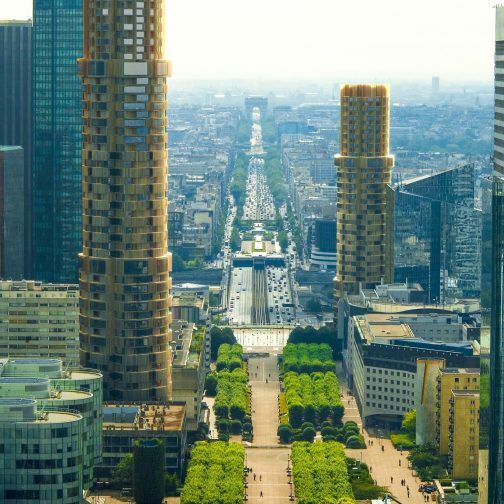 An interesting prospective article in Les Echos, showcasing opportunities to make forest-cities of our living spaces. 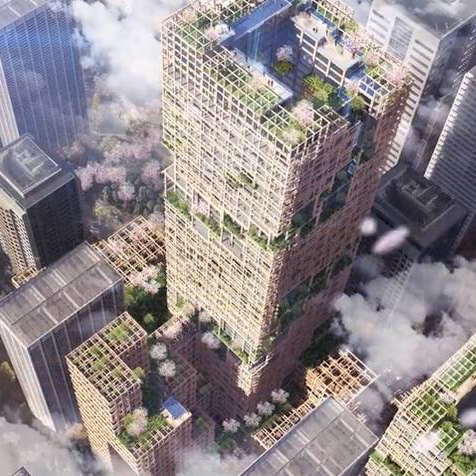 It features the W350 Sumitomo tower, and how Woodoo could provide a technical answer to this ambitious project and reconcile ecologists and architects (article in french). 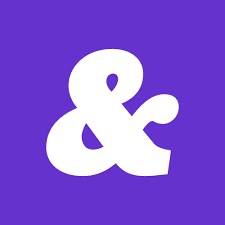 Europe’s largest automotive innovation platform starts its fifth round with 34 startups from 10 countries (including 25 from Europe, 5 from the USA, 4 from Israel) this 21st of February. 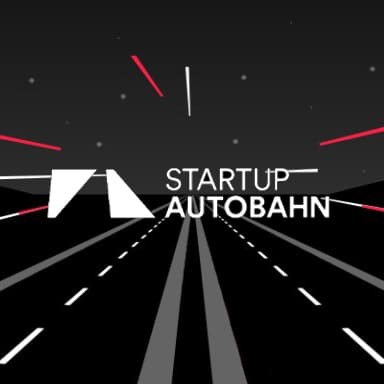 STARTUP AUTOBAHN present the newest technologies, facilitate joint projects between startups and corporations, and offers access to VC’s, mentors, hardware lab, expertise, tools and office space. Woodoo will be showcased on the event with its latest tactile onboard HMI, designed for one of the major Premium German car manufacturer. We can’t wait to unveil! 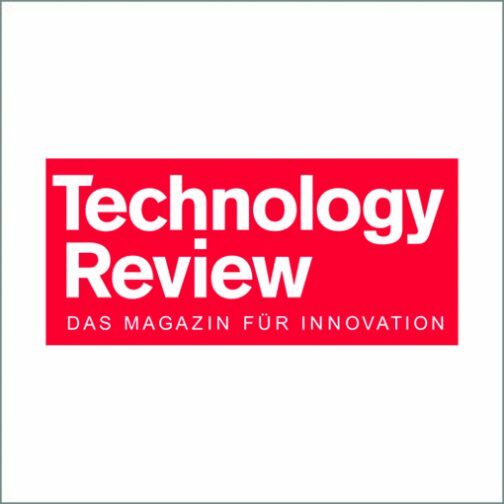 Woodoo is featured in Technology Review from Heise. 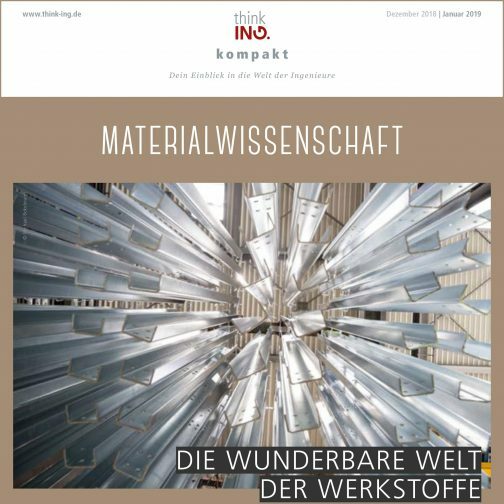 Discover their overview of some of the most promising biomaterial initiatives and wood projects around the world (in german). The “Aujourd’hui pour Demain” series on Motherboard (the VICE channel that decodes the relationships between technology and society) explores the technology initiatives that are building our future. Awarded by EDF Pulse 2017, Woodoo’s innovative augmented wood is one of the most promising in the world. A video in french. Woodoo has been labelled as a Solar Impulse Efficient Solution, one of the 1000 clean and profitable solutions selected by the Solar Impulse Foundation to help decision-makers adopt more ambitious environmental targets and energy policies. 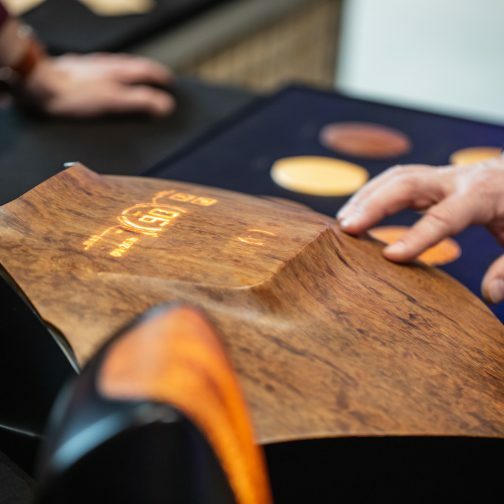 During the luxury and packaging event of the “Places d’Or” 2018, Woodoo reveals for the first time to the public the exceptional qualities and properties of its differents wood species. 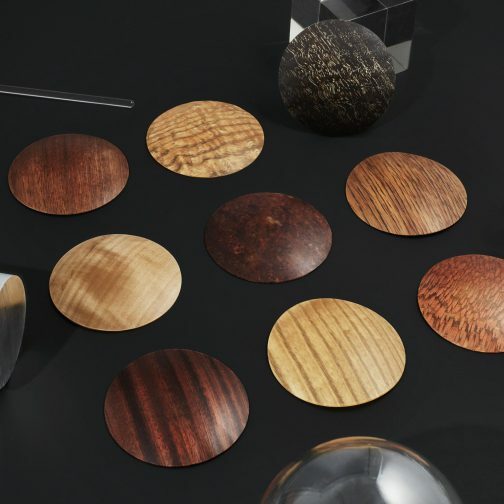 Walnut, sapelli or smoked eucalyptus can be discovered alongside the amazing plane tree, with its panther skin paterns, or the “simple” poplar, finally enhanced by the exclusive patented process of Woodoo. Young bio-engineering startup specialized in the development of augmented wood, Woodoo transforms real wood and reinforces it at the molecular level to make it 3 times sturdier than conventional wood, weatherproof, more resistant to fire, 100% recyclable and incredibly translucent: an advanced high-performance material with unrivaled environmental performance and unprecedented aesthetics. 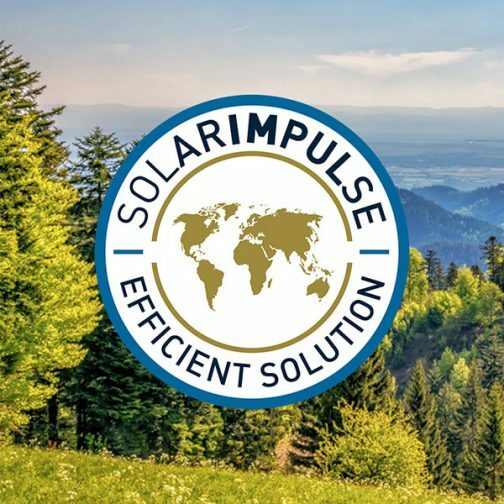 Its vast field of innovations has been rewarded with many international and national awards (MIT Innovator of the Year, Horizon 2020 Award from the European Commission, Solar Impulse Award…). 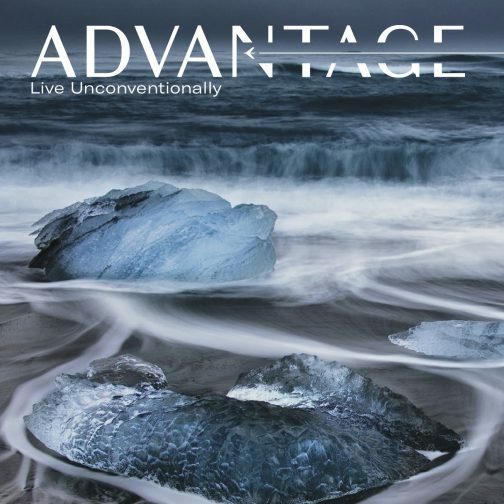 The applications for this extraordinary material range from luxury to packaging and automotive, and soon to construction. Come and discover it from November the 13th to the 15th in the prestigious setting of Hotel Le Meurice in Paris! 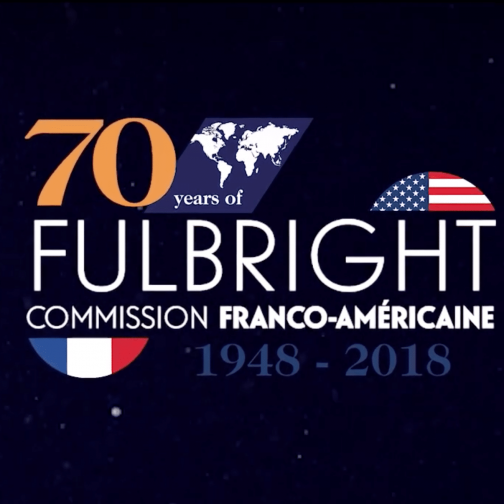 Fulbright, a Franco-American commission, has been a key partner in Woodoo’s development. 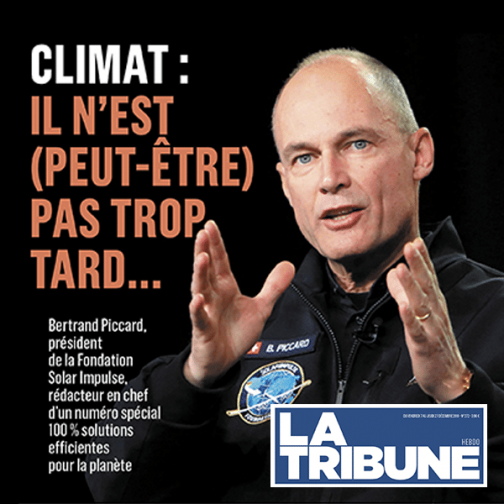 Presentation by Timothée Boitouzet for the Fulbright For The Future award (in french). 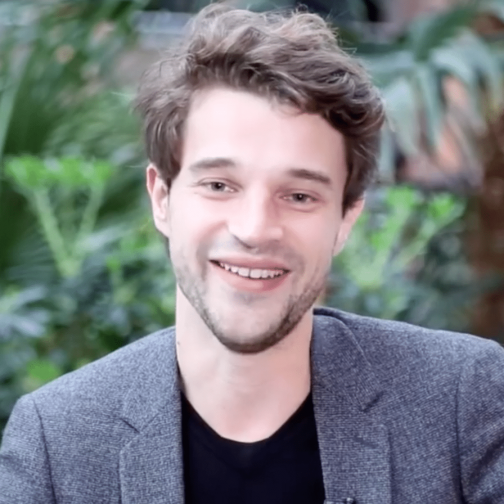 In an interview by Usbek & Rica, Timothée Boitouzet explains Woodoo’s vision: reinvent wood to build the city of tomorrow (in french). When the planet is home to the almost 12 billion people that the UN calculates will inhabit the Earth by the year 2100, where will they live? In less than 15 years, the organization estimates that there will be 3 billion people in need of proper housing worldwide. Against this backdrop, any sustainable and economically viable option that allows us to create new housing more quickly and efficiently could form part of the solution. And the young, French architect Timothée Boitouzet has a wood-based proposal that could serve just this purpose. 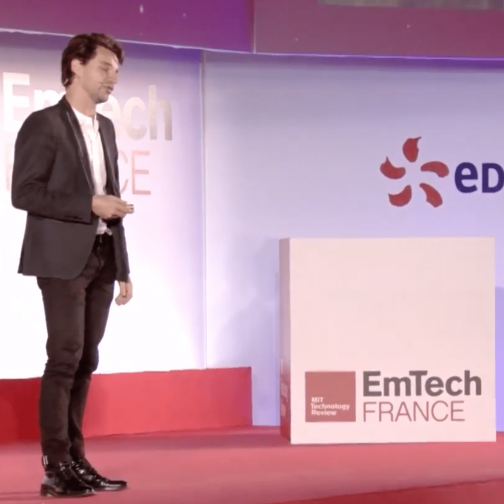 Keynote by Timothée Boitouzet at EmTech France, as the MIT Technology Review french innovator of the year 2016. 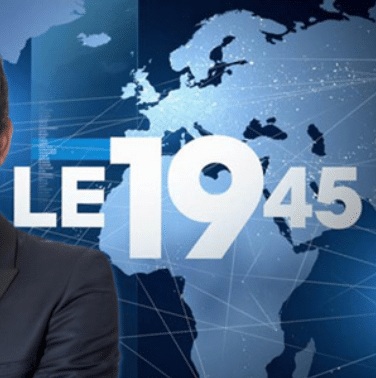 Timothée Boitouzet in a report and an interview on the French television France 3, in the economical TV Show “In Situ” (french version only). 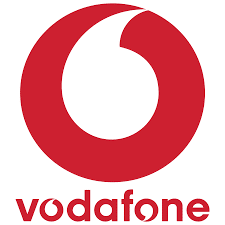 Woodoo presented by Vodafone One (in spanish). 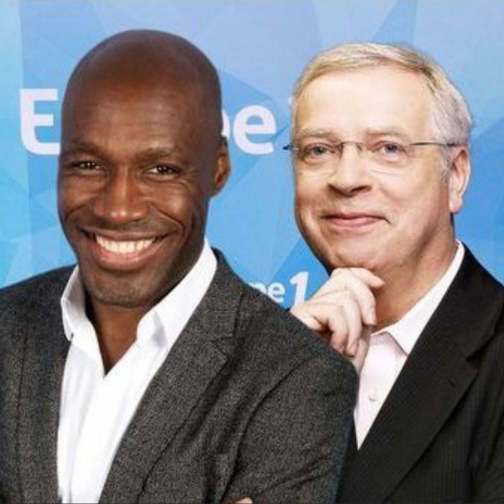 Overview of Woodoo by Timothée Boitouzet in La Terre from french radio program Europe 1 Demain (from the 28th minute). 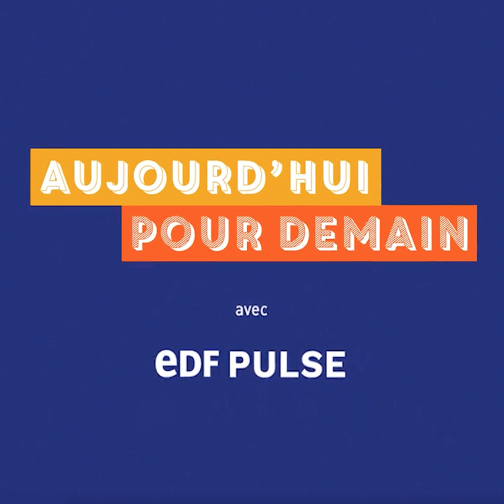 This program, presented by Anicet Mbida and Alain Cirou, highlights french solutions, initiatives and innovations that help building a better future (in french). Woodoo presented by Timothée Boitouzet at the event L’Echappée Volée, now BOMA France (in french). Woodoo presented on french TV M6 in the information program 19.45 (in french). 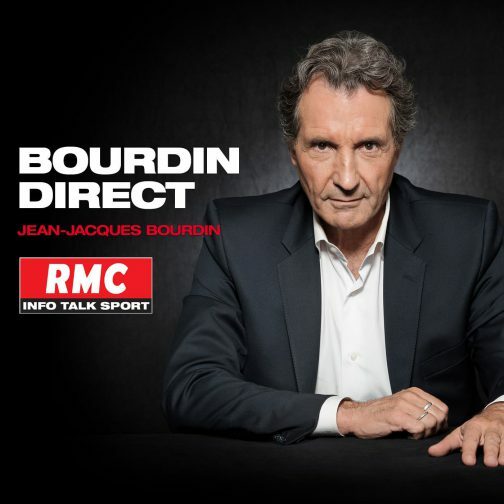 Woodoo reviewed by Anthony Morel with Jean-Jacques Bourdin: “super wood” for the architecture of the future, in Bourdin Direct show on french radio RMC (in french). 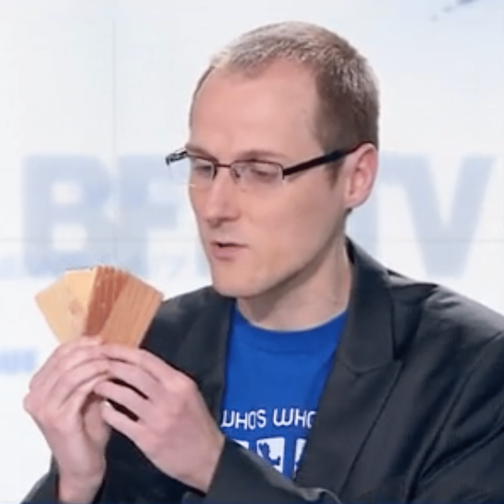 Anthony Morel highlights Woodoo’s “reinforced wood” on french television BFMTV, in Culture Geek show (in french). 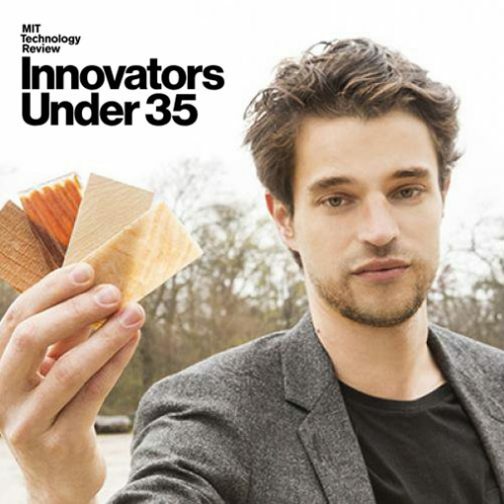 Winner of the MIT prize for innovators under 35, Timothée Boitouzet has developed a hybrid wood that could revolutionize the construction sector (in french). 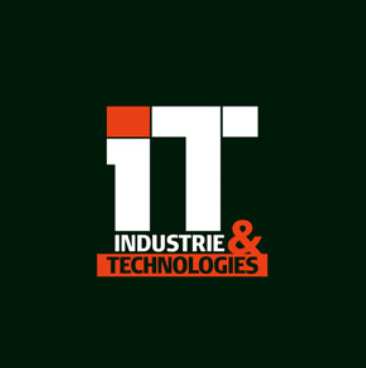 Woodoo presented by Virginie Garin, in the radio show Terres d’Innovations, on french radio RTL (in french). Timothée Boitouzet’s election as Innovator of the Year by the MIT Technology Review, lived by the Franco-American commission Fulbright (in french). One minute to learn more about Woodoo. Filmed by Welcome To The Jungle for the Concours Edhec Entreprendre (in french). Cut out a very thin slice of wood and you can observe a slight transparency. Nice, but very fragile. Fortunately, Woodoo decided to offer transparent wooden boards. Our ingredients: biosourced polymers that were injected into the wood, he was allowed to let 10 to 20% of the light and make it more resistant.